Weekend Picks: Tree Lightings, Festival of Lights & Theatre of Lights! November is wrapping up quickly so get ready for a weekend full of celebrations along the Capitol Corridor! The waterfront will light up in Jack London Square, watch a theatrical holiday production in Old Sacramento, see the transformation of San Francisco’s historic Union Street into an illuminating winter fantasy land, and visit San Jose’s annual Christmas in the Park. 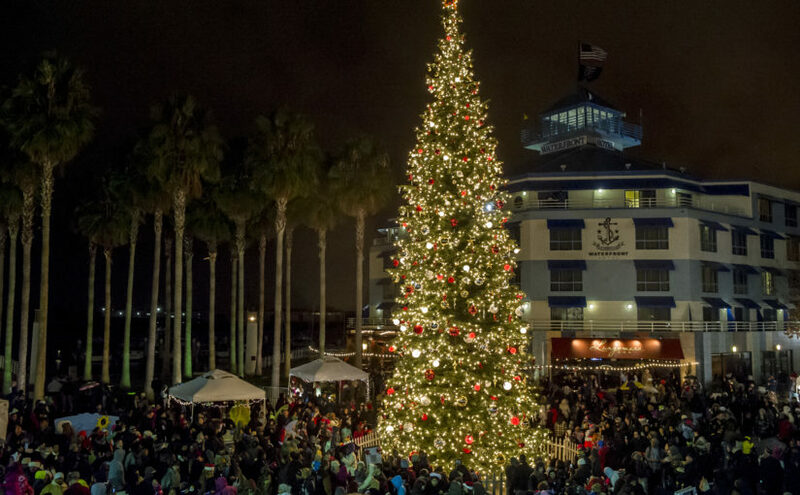 Ring in the holiday season with the annual tree lighting ceremony on the Oakland waterfront at Jack London Square Tree Lighting. From 5pm to 7pm on Friday, come and watch the lighting of the spectacular 55-foot Mount Shasta Fir Tree. The tree is adorned with 5,000 sparkling white lights and 600 colorful ornaments. Local musicians and arts groups will provide entertainment while The Urban Air Market will host DIY workshops and holiday pop-up shops. Even Santa will make an appearance! In the spirit of the season, the event will host a donation drive to collect non-perishable foods, unwrapped toys, and gently worn coats for several nonprofit organizations. Getting there: Take the train to the Oakland Jack London Station, which is steps from the event. Enjoy a festive holiday program on the balconies and facades of Old Sacramento at The Ninth annual Theatre of Lights. Don’t miss the lighting of the 60-foot Christmas tree by St. Nick himself, and through a holiday performance discover how early pioneers experienced the calamities and revelry that befell the new city of Sacramento in the 1850’s. The production will be staged from the balconies of the buildings while the audience watches from K Street. A highlight of the performance will be an enactment of Moore’s 1823 poem, “A Visit from St. Nicholas,” more popularly known as “Twas the Night Before Christmas”. The event will continue through the end of December on Thursday and Sunday evenings, with start times at 6pm and 7:30pm. The full schedule, including special holiday performances, is available online. Getting there: Take the train to the Sacramento Station, which is a five-minute walk to Old Sacramento. Join in the annual Union Street Fantasy of Lights Celebration. On Saturday celebrate the season’s festive decorations when thousands of twinkling white lights illuminate the historic Victorian houses and shops along Union Street between Van Ness and Steiner, and Fillmore Street between Union and Lombard. From 3pm to 7pm, a lineup of family-friendly activities will include photos and a meet and greet with Santa, horse drawn carriage rides, ornament crafting, and ponies dressed up like reindeer. Each block will also feature face painters, balloon artists, costumed characters, singers and other live entertainment. Guests are encouraged to bring new toys for the San Francisco Firefighters’ Toy Program. Getting there: Depending on your station of origin, take the train to the Richmond Station or Oakland Coliseum Station , connect to BART to Powell Street Station. From any of these San Francisco bus or BART stops, you can take public transit using Google Maps, catch a cab, or take Lyft or Uber. For 30 years Christmas in the Park has transformed the Plaza De Cesar Chavez into a Christmas wonderland! Spanning two-acres, the park is filled with over 40 musical and animated exhibits, holiday lights, and a 60-foot Community Giving Tree. The exhibits are open every day 9am to midnight, but be sure to check the website for special events and the opportunity to take a photo with Santa. Christmas in the Park is a fundraising event, so although admission is free a small $1.00 donation is requested to keep the event running and free for the public to enjoy. Getting there: Take the train to the San Jose-Diridon Station and use a Ticket Transfer to ride VTA to Plaza De Cesar Chavez. You could also take a short cab, Lyft, or Uber ride to the event.